The most important is the sendTimeout, which says how long the client will wait for a response from your WCF service. You can specify hours:minutes:seconds in your settings - in my sample, I set the timeout to 25 minutes. The openTimeout as the name implies is the amount of time you're willing to wait when you open the connection to your WCF service. Similarly, the closeTimeout is the amount of time when you close the connection (dispose the client proxy) that you'll wait before an exception is thrown. The receiveTimeout is a bit like a mirror for the sendTimeout - while the send timeout is the amount of time you'll wait for a response from the server, the receiveTimeout is the amount of time you'll give you client to receive and process the response from the server. In case you're send back and forth "normal" messages, both can be pretty short - especially the receiveTimeout, since receiving a SOAP message, decrypting, checking and deserializing it should take almost no time. The story is different with streaming - in that case, you might need more time on the client to actually complete the "download" of the stream you get back from the server. There's also openTimeout, receiveTimeout, and closeTimeout. The MSDN docs on binding gives you more information on what these are for. and you also spend some time watching her 15-part "WCF Top to Bottom" screencast series - highly recommended! For more advanced topics I recommend that you check out Juwal Lowy's Programming WCF Services book. See this series of web casts by Michelle Bustamonte. If you are a beginner, this is one of the best sources to learn WCF. You can also start with the book Learning WCF. Learning WCF: A Hands-on Guide by Michele Bustamante - very nice kick-off book with step-by-step tutorials. Michelle also has a series of webcasts published on MSDN. Programming WCF Services by Juval Lowy - more systematic approach, for experienced web developers. Edit: No sure why her site isn't responding; it's been a while since I've visited, so maybe she shut it down. No sure. I guess you'll want to check WCF Membership provider. I posted a few months about it http://sgomez.blogspot.com/2007/12/wcf-membership-provider-sample.html follow the links and also I'd recommend the book Learning WCF by Michele LeRoux Bustamante. It allows you to expose a service using multiple protocols and multiple security contexts. 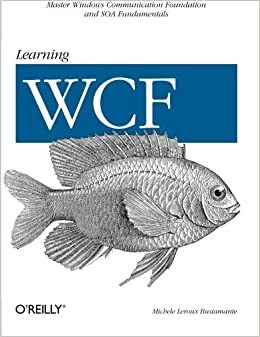 A very good resource for learning WCF is Michele Bustamante's book Learning WCF. http://www.amazon.com/Learning-Hands-Michele-LeRoux-Bustamante/dp/0596101627 Note: If you do get this book, she has an updated version of Chapter 1 and an appendix on her website.